Sad to hear of the loss of Wallander’s creator, Henning Mankell, after battling cancer for some time. 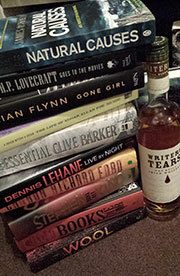 He leaves behind a legacy of great reading and, as a result, some superb crime television too. Although written some years ago, and selected as one of the stories adapted for the Kenneth Branagh incarnation of the Swedish detective for the BBC television series, An Event in Autumn is only just about to see the light of day as a published novella in the UK in September,thanks to Vintage Books. As police officers comb the property, Wallander attempts to get his new life back on course by finding the woman’s killer with the aid of his daughter, Linda. But when another discovery is made in the garden, Wallander is forced to delve further back into the area’s past. I’ve always found ‘Detective’s on holiday or at home finding or solving crimes’ a bit of a tough pill to swallow, after all most of us in our day jobs don’t find we end up doing the same things in our home lives, but this was a definite exception to the rule. Told tightly and swiftly, this is a great little book – a perfect introduction to the character of Wallander to those who’ve yet to discover him, and a welcome additional chapter for the man for those of whom have loved him for years in any of his carnations in Mankell’s numerous novels or the many television versions. 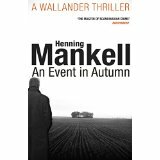 Just goes to prove once again as to what a master of Scandi crime Henning Mankell is.